Daffodils are currently in season in South Africa and we’re absolutely loving it! NetFlorist has an entire range of dandy daffodil plants ready to be delivered, sameday. The golden blooms commonly symbolise rebirth and new beginnings. It is officially the March birth flower and the 10th wedding anniversary flower. A daffodil plant gift is said to ensure happiness. It is, however, believed to be bad luck if you gift someone with a single bloom. A single daffodil bloom can supposedly foretell misfortune. 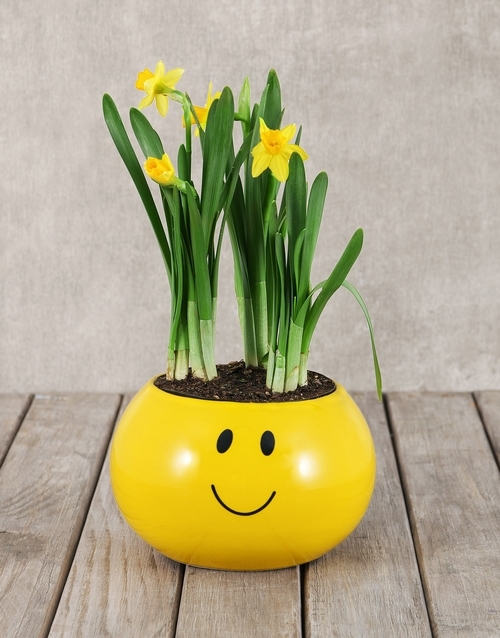 Be the sender of smiles and happiness with this vibrant daffodil plant, which comes presented in a unique ceramic smiley pot. It will certainly brighten any day so send now! Daffodils fall into the genus Narcissus. Narcissus was the name of a Greek god that fell in love with his own reflection. He didn’t realise that the reflection was his own. Every time he bent down to kiss it, the reflection would disappear. Narcissus grew increasingly thirsty, but would not leave or touch the water for fear of losing sight of his reflection. Eventually, he died of love and well, thirst… On that very spot he died, a narcissus flower grew. Spoil someone special with these classic daffodil blooms which come presented in a lovely round ceramic pot with moss and raffia. It will look great in any setting! Colour of the plant may vary. 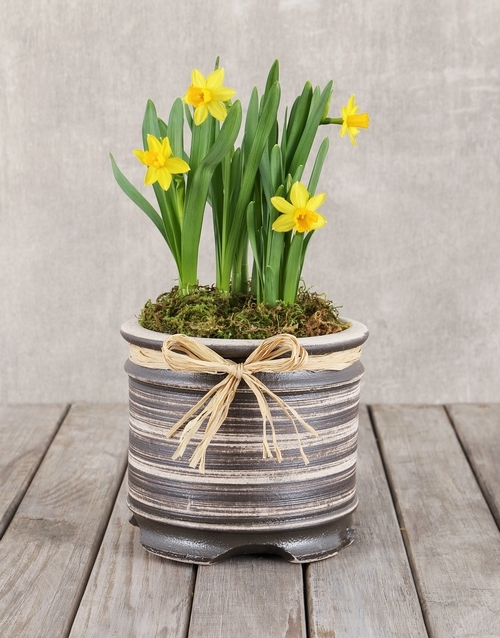 Flower arrives in bud Get this Daffodil Plant In Round Ceramic Pot delivered with NetFlorist. 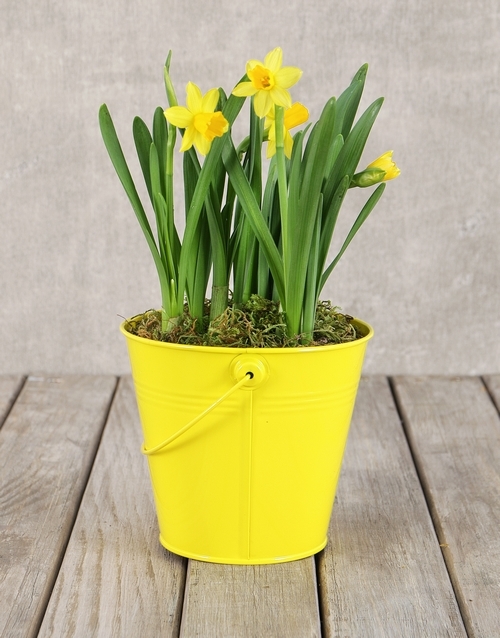 This bucket full of beauty will lift anyone’s mood, with a blooming daffodil plant which is presented in a yellow bucket tin with moss. Send now! Daffodils give off a sap that can be deadly to other plants. It is, therefore, advisable to plant them separately from other flowering plants. They are also poisonous to pets! A positive is that the plant is also rodent-resistant. Be sure to water the plant generously while the daffodils are blooming. Provide a handful of bulb fertiliser or any general-purpose fertiliser when shoots poke through the ground. When a bulb becomes ‘bloomed out’, more are produced to continue the plant. Divide daffodils every three to five years, or whenever you begin to notice that the flowers are smaller in size. Divide the bulbs when the foliage has died as the dead foliage will ensure healthy bulbs. The bulbs will have plenty of stored sugar for the next year’s growth. Use mulch to protect the flowering plant from cold, drying winds. Visit netflorist.co.za and have a look at all of our daffodil plant range. Place your order today for delivery nationwide. NetFlorist will complete your plant gift delivery on your behalf!